The Curved Back is designed for users who require a solid back support. 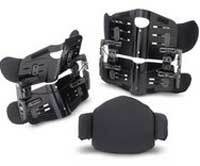 Accessories, such as lateral supports, shoulder supports, and a headrest can be added and adjusted easily. The Curved Back will benefit users who want firm support and the ability to offset the hammock effect of sling upholstery. Slightly curved profile fits natural back contours. Combination of comfort foam and visco-elastic foam with built-in sacral support provides pelvic positioning. Strong curved plywood is T-Nutted for easy interfacing and adjustment of lateral supports, shoulder supports and headrests. Drop-hooks and twist-and-release cane clamps improve portability and allow for changes in orientation of the back within the chair frame. The versatile Invacare Personal Back is designed to provide the user with postural support and spinal alignment. 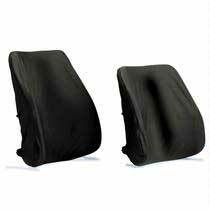 It provides comfort and lateral stability with lumbar support and built-in lateral supports. Quick Set(TM) hardware features self-adjusting cane clamps. Lightweight aluminum shell for increased strength and durability. Pre-drilled headrest mounting pattern for easy attachment of headrests. Laterals redesigned to increase midline support without interfering with upper extremity movement. Wide range of sizes to fit the user and chair dimensions. The Infinity line of backs from Invacare feature a modular design the can accommodate a wide range of body sizes and types, while easily adapting to growth with a minimal number of components. These unique backs allow for configuration to the desired postural support level, and depth of contour, while adjusting easily to provide optimal balancing of the body within the wheelchair frame. Includes a Thoracic Support Panel in addition to a Sacral Support Panel for users who need a higher level of back support. 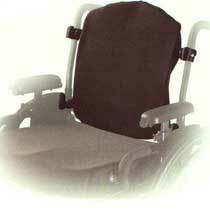 Width-adjustable mounting hardware fits up to three wheelchair widths per model. Quick-release hardware facilitates removal of back from wheelchair for portability. Attractive canvas cover hides underlying hardware. Lightweight only adding up to 5 pounds to weight of the wheelchair.